Show runs from April 6-14, 2017. Reception is on Wednesday, April 12, Noon to 1:30 pm. 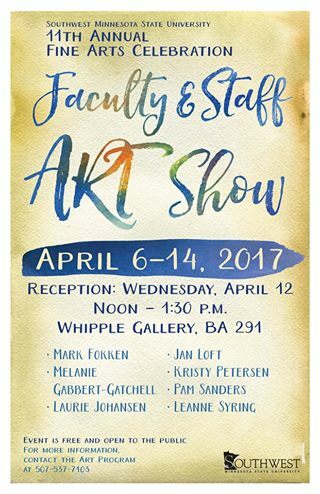 Featuring the works of Mark Fokken, Melanie Gabbert-Gatchell, Laurie Johansen, Jan Loft, Kristy Ptersen, Pam Sanders, and Leanne Syring. This event is free and open to the public. For more information, contact the Art Program at 507-537-7103.